I wrote this after dreaming about it. I'm not kidding, I had a very clear and vivid dream and wrote it all down immediately after waking up, and this was it. To be a child of the Majestic Serpent is to live forever. It is to reign forever. It is to possess unlimited earthly treasures. It is superiority over others. It is the preservation of your soul. Only those who know the Secret of the Serpent will be accepted into his dwelling. “Clive, I want to make a new album. I have all these fantastic ideas, we need to stop sitting on our asses and make some music!” Sapphire said to Clive in earnest - her boyfriend and the drummer of her band. “You know what Saph, you’re right. Let’s call the guys.” Clive replied, after a dramatic drag on his cigarette. Clive calmly snuffed out his cigarette and slid closer to his girl, who was now mindlessly scrolling through her phone. He slung an arm around her shoulder and planted a kiss on her cheek. “If that’s what you want darling, that’s what you’ll get.” He said with a crooked smile. “Excellent. When shall we break the news to him?” Sapphire asked as she closed her phone and slid it into her back pocket as she stood up. “How about we go right now?” He suggested, a mock-innocent smile playing on his lips. “Yep” She quipped, without even turning around. Cracking another smile, Clive followed her dutifully. Sapphire pulled into Lawny’s driveway and jumped out of the car without hesitation. She marched up his driveway and walked right into the house like she’d been doing for years. Clive was grateful that he’d thought to send Lawny a quick text, at least he was expecting them. “Hey, guys!” Lawny said happily, swiveling around on his desk chair as Clive and Sapphire plopped onto his bed. “New music on the horizon?” He asked, looking expectantly at Sapphire. She was always writing new material and kick-starting the band into action. Clive would have liked to break it to Lawny with a little bit of gentle finesse, but he knew that Sapphire preferred to do things her way. Abrupt and heartless. “Not exactly” Sapphire started curtly. “Clive and I both agree that you haven’t been playing very well at all lately. We want you out of the band effective immediately.” With that, she stood back up and headed for the door. Clive shot a glance at Lawny’s face, which was an expected mixture of shock and devastation. Clive knew that Lawny’s music meant everything to him, but his devotion to Sapphire was stronger than his feelings for any other, and he couldn’t help but crack an adoring smile at the way she just didn’t seem to have any feelings or conscious. Except for him. Oh yes, she had quite a few feelings for him, as proven by the passion she exhibited during their more intimate nights together. He shot the unmoving form of Lawny a half-genuine shrug of apology before getting up and following Sapphire out the door. And with that, everything was ready. Lawny sat gingerly in the middle of the circle he had formed, folded his hands in his lap, and closed his eyes, a feeling of contentment coming over him as he knew full well what was in store for him now. “My Serpent Master. I am surrendering myself willingly. Please come to greet me at the door” Lawny said, opening his eyes and smiling at the grand, old-fashioned red and gold door of fire that stood before him. He felt a flutter of butterflies rise in his stomach when the door began to crack open, and he laid his bare eyes on the face of the Serpent, at long last. “My Master, I have suffered something worse than death. My destiny was taken away from me for reasons beyond my control. I have willingly entered your domain to reclaim it, as I know my life has been good and my intentions are true. I plan to enter your dwelling and return to earth reborn, ready to continue on the path that was meant for me.” Lawny said, reciting his practiced speech perfectly as he bowed his head in respect for The Master. Lawny stood at the flaming doorstep in shock for the second time that day. Within seconds, he realized what would happen now, and he screamed as the earth opened up beneath him. He screamed and screamed as he was swallowed by a horde of ever-darkening flames. 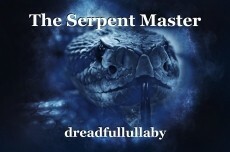 Lawny could hear the Serpent Master still laughing, as he continued to scream a scream that would never cease. “So what’s the plan then? When do you think we’ll be recording? A few weeks maybe?” John asked hopefully, looking right at Sapphire with wide, bright blue eyes. Appreciating her bass players’ enthusiasm for the new music, Sapphire nodded. “Yes, I plan to have us starting in four weeks. Maybe five. Six tops. The music is all in my head, I just have to get it down on paper.” She said in her best ambitious, business-like tone. “Wow, that’s awesome Saph. I just love your passion, and your dedication. It’s been nice to take a little break, but I’m honestly so pumped to make some new stuff. And to get on the road again! What a rush that’ll be!” John exclaimed excitedly, still talking to Sapphire and barely acknowledging Clive’s existence, let alone his presence. “Look at that idiot,” Clive thought to himself. “Flirting with my girl, right in front of me. Barely even said hello. The dude can play, but holy crap. He’s annoying. Good gracious, he’s annoying.” Clive clenched his teeth as he seethed in silence, trying not to disrupt the increasingly gushy conversation that was going on beside him. Sapphire liked John, he knew that much, but she’d never be into him. Why can’t he see that? She’s never once flirted back. She probably doesn’t even know about his embarrassing little crush. Clive tried to calm his mind, tried to ignore the growing annoyance in his chest, but it was becoming too much. He’d forgotten how irritating it was, watching this kid try to get with his girl. Or maybe he’d fallen even more in love with her during their little break. That was probably it because he didn’t remember it being this annoying. He couldn’t work like this. No, it just wasn’t happening. “You know what John?” Clive almost shouted, interrupting whatever he was going on about. “Sapphire is never going to love you. She’s never going to sleep with you. She’s never even going to kiss you! Cause guess what? She loves me, she kisses me, and she sleeps with ME! Yeah. Every night bro, every night. Get used to it, and just shut up already. Actually, why don’t I just take care of that for you?” Clive finished his rant, putting a sickly sweet question mark on the last sentence. Without even missing a beat, Clive pulled out the small handgun he always kept hidden in the back of his pants, and he shot John straight between the eyes. Sapphire looked on with mild shock and John fell backward onto the bed, dead before he hit the mattress. After a few seconds, she chuckled. “Well. That’s that then! Guess we should start placing some ads huh?” She said cheerfully, as she hopped up to give Clive a kiss on the cheek before grabbing his hand and pulling him down the hall, out the door, and back to the car. “That’s my girl,” Clive said under his breath, smiling ear to ear. “What’s that babe?” Sapphire asked as she looked over at him from the driver’s seat with her beautiful, questioning green eyes. Clive smiled and they settled into a comfortable silence for a few minutes as Sapphire drove home. It wasn’t long before he came to realize the full meaning of what she had just said. “Wait Saph, do you mean….” He trailed off, hoping she’d catch his drift. “Perfect!” She exclaimed, glancing over at him with eyes full of excitement and anticipation. Upon returning home, they took to the couch for a few hours to watch some movies and kill some time. Around 9 pm, they decided to start. They gathered the necessary ingredients, and sat down, joining hands. “Ready?” Sapphire breathed, hardly able to contain herself. “Ready,” Clive said, never having been more sure of anything in his life. They closed their eyes and began their spiritual journey towards that beautiful red and gold door of fire. My Serpent Master, I am surrendering myself willingly. Please come to greet me at the door.” Sapphire started with the required greeting, followed immediately by Clive. They waited a few moments, before seeing the first of the flames move, followed by the rest, to reveal the dark, malevolent and utterly beautiful face of the Serpent Master. They exchanged a quick look, silently agreeing that Sapphire should do the talking. Clive and Sapphire let go of each other's hands for the first time and followed the Serpent through the flaming door. “We did it, babe!” Clive said as he rejoiced with a slightly effeminate victory dance. He would never, ever admit it to Sapphire, but he had had the slightest bit of doubt. He was a tiny bit unsure, wondering if perhaps they’d gotten the Secret of the Serpent all wrong. Clive all but skipped over to his drum kit in the corner of his room, picking up his sticks in the most graceful manner possible. He began to play, effortlessly hitting every note, becoming more and more skilled with every passing second. He had sold his soul to the Serpent, and he couldn’t be happier. © Copyright 2019 dreadfullullaby. All rights reserved.